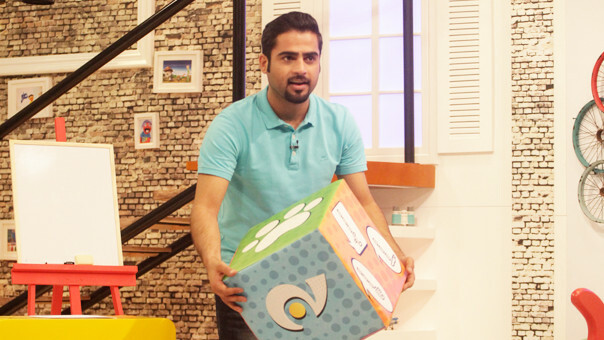 Presented by Hassan Al Mulla, Jeem Jawab is an exciting game show that tests your knowledge, intelligence and intuition. JeemTV logo: Which will qualify you directly to the final random draw. Box: You have to guess what’s inside the box in the studio. Brain: You will be asked a question regarding a certain video that will be played. Question mark: You will be asked a riddle to solve. Animal’s hand: We will test your knowledge about the animals’ world. Arabic Alphabets: You will play with the letters to create words. Accordingly, get ready to mention the name of a person, plant, or city that starts with the letter that Al Mulla will choose. This is a competition between two contestants who will get to see 16 numbered cubes. Underneath each cube, a set of pictures will be shown for 10 seconds. The contestants should well memorize the locations of the pictures before they get hidden. The participant who gets the highest number of scores will be qualified for the random draw. In case the two contestants got equal scores, they will both enter the random draw stage. The contestants play the role of TV presenters and send us videos for this competition. For more details, click here. Through this hashtag, you can send us videos or pictures related to JeemTV, on social media networks, to be able to see them on air in the show. The first-ranked winner will get 3000 QAR. The second-ranked winner will get 2000 QAR. The third-ranked winner will get 1000 QAR. If your age is from 7 to 12, join the fun and call us every Saturday, 7 pm Mecca time on 0097444538888.